with FREE delivery to West Malaysia. Family outings, trips with friends, weddings, anniversaries... these are the amazing moments that bring colours into our life! While you have captured these priceless moments with your digital camera, you SHOULD preserve it in a form that is easy to view any time and shouldn't be kept hidden away as pixels and bytes inside your computer or external harddisk! For a limited time only, Pixajoy is offering their PHOTO BOOK at a steep discount, specially for their new customer. If you're new to Pixajoy, you are entitled to purchase a 20-page softcover photo book at only RM10, with FREE delivery to West Malaysia location (normal price: RM60). No design worries! With Pre-Designed Theme Templates you can finish your photo book design in just 1 hour. Just drag & drop your photos into the ready-designed pages and you're done! If like you can also add your own words, captions or favourite quotes. This is a deal you can't find elsewhere! 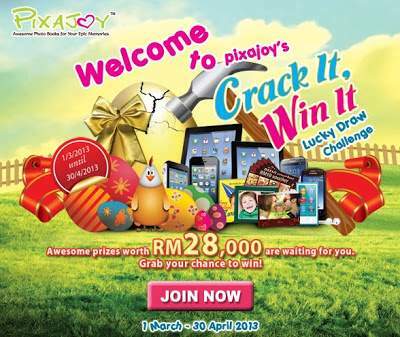 PLUS, you will be entering Pixajoy's "Crack It, Win It" Lucky Draw Challenge and be in the running to win exciting prizes worth RM28,000 (Samsung GALAXY SIII Mini, iPad 4, iPhone 5, RM20 KFC Vouchers and many more)! Join the contest (sign up is FREE). You will get a lucky draw ticket and contribute 1 hammer point. These details will also help Pixajoy to contact you if you’re the Winner. LIKE & SHARE out this great offer!